A couple of months ago when I mentioned that I was storing our potatoes in the fridge, Daddy emailed me to say that was a bad idea. So I poked around on the internet, and quickly found lots of unofficial sources agreeing with him. However, when I went to the experts, I discovered that the worst thing to happen to potatoes in the fridge is that cold temperatures result in starches being converted to sugars, making your potatoes taste sweet and fry up dark. We plant Yukon Golds specifically because we like the sweet taste, so that chemical change wasn't enough to deter me. Our homemade chicken waterer prevents coccidiosis. I can tell you are a miracle whip fan like me!, DH cracks on me about it as he will only eat Hellmans. Actually, it's store-brand mayonaisse --- we eat mayonaisse so rarely that I don't buy any particular brand. I'll bet the store-brand designer was trying to make it look like Miracle Whip, though. When I was little, we kept the potatoes in the aboveground cupboard under the stairs. Which didn't work that well in a house with central heating. At that time it was recommended that they be kept in a cool basement. Which was kind of silly, because very few houses here are built with an underground basement because of the high water table. So after I moved out to an appartment I started storing them in the bottom drawer of the fridge without ill effects, as far as I can tell. 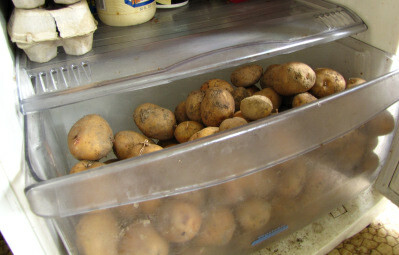 Sacks of store-bought potatoes nowadays carry the advice to store them in the fridge. I don't think that I've ever read anything on a bag of potatoes other than the variety --- what a smart way to figure out how to store potatoes! As Titus mentioned over on facebook, the one downside of storing the potatoes in the fridge and the ensuing sugars is that it makes the potatoes a bit worse for you since it increases their glycemic index. However, I don't think that white potatoes are good for you in any form, so we eat them rarely. Lately, I've had more of a French mindset about food --- eat what tastes good, but take the rich foods in extreme moderation. Growing up in Alabama, we would put the potatoes in a single layer in a dark stall of the barn and cover them with a layer of hay. Each week through the winter we would go get a bucket of potatoes from the barn. Some would get chewed by mice but we didn't lose many and they would last fine until the earliest spring. It does get cold in north Alabama but the hay kept the potatoes from freezing and rotting. I guess they cold probably had the same effect as their being in a refrigerator. You might be able to make a storage spot under your trailer that would stay dry and be handier than the buried freezer but cooler during the winter than under the bed. The best way to keep irish potatoes fresh and crisp all winter it to mound them on the earth, cover with straw, add a thick covering of dirt, and top with something waterproof. A stovepipe into the mound from the side, at ground level, allows you to reach in and pull out potatoes without disturbing the pile. The pipe should be stuffed with old rags, feedsack or other object to keep it insulated and keep the varmits out. The straw covering is made up of bats thick as a new york phone book. Lisa --- I've read about people storing potatoes and apples in the barn, but I've always assumed that's in a warmer climate than here. Looking at a zone map, you're probably either in zone 7 or 8, and we're in zone 6, so I'd be leery of trying it here. Daddy --- We actually made a potato clamp (which is what that's called) a couple of years ago. I wasn't overly pleased with the results since quite a few of the potatoes froze and rotted. Granted, as I mentioned in the above linked page, there were quite a few things I could have done differently that might have improved our results. This post got me remembering other ways I've seen food stored. When I rented a farm in Vinton County, Ohio, I tried a local way of storing cabbages. They were buried with their stems sticking out of the ground. It worked quite well. I met a family near Frankfort who were pre-canning. Green beans were strung around the house to dry (leatherbritches). Their fruit was either sliced and dried, or, with apples, was stored in baskets on top of which a saucer of sulfur was burned while the basket was covered to keep in the fumes. Meat was salted or smoked and hung in the smokehouse. Grain was stored in an airy place with wire to keep out the rats. In Virginia I kept apples and onions in the barn on top of bales of hay. Daddy --- I'll bet the cows in the barn helped raise the temperature and keep it above freezing. I've read that really old timey people used to stable their livestock under their house for exactly that reason. I've heard about people storing cabbages that way and have always been curious about it! Maybe one day I'll try it! Why do you think potatoes are unhealthy? On a more positive note, sweet potatoes are supposed to be a little better for you since they have more nutrients to balance out all those carbs. I think it's only 2% proteins; 2 grams out of 100. Or do you only consider the fraction of the dry weight? In that case it's 8% by my calculation. With regard to nurtrition, I try to follow the "wheel of five". But I'm not sure that food composition is as critical as some diet gurus want us to believe. People through the ages have adapted to many different diets (e.g. some groups can digest lactose while others can't). You do the percentage by calories --- how many calories of protein are in the serving versus total calories. I consider the major decline in health of people as soon as they became farmers an indication that diet is important, and that changing over to a carbohydrate-based diet is not such a good idea. I know that in the last couple of months as I've been decreasing the carbohydrates in my diet, I've been much happier! Susan --- Thanks for sharing. Since we eat so few products that are likely to produce acrylamide (grains and potatoes), and since the FDA isn't actually sure that it's not safe when eaten in small quantities, I don't think I'm going to worry.